This recipe was carefully written on a 3×5 index card and placed in my wood recipe box. This was early 2007 when I decided that I would try my hand at cooking. I burned some barley, made an amazing blueberry coffee cake, and decided that I would continue on the cooking track. I can’t remember where I got this recipe from. Wherever I did, thank you! It’s very good. And easy! I like easy, especially when entertaining friends during the week, while dealing with communing roughly 2.5 hours a day. 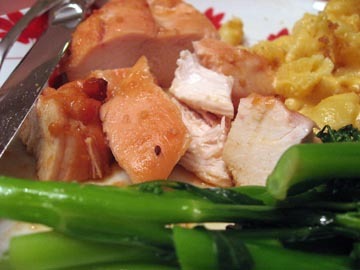 This is a five ingredient recipe: chicken, honey, teriyaki sauce, orange juice, and mustard. Season both sides of chicken with salt and pepper. Place chicken in shallow baking pan. In a medium bowl, whisk together remaining ingredients. Pour mixture over chicken. Bake uncovered for 45 minutes, occasionally basting the chicken with the mixture. I served this with penne and cheese and some blanched broccoli rabe sauteed with some garlic. This sounds delicious, and I will be trying this tonight! Serving it with the blanched broccoli rabe sounds even better, yum. We’ll probably have ours with rice and steamed broccoli.